I am an unashamed lover of linen. This beautifully tactile material is no stranger to Brit Decor, last seen gracing the pages of the blog in my Linen Crush feature back in June. 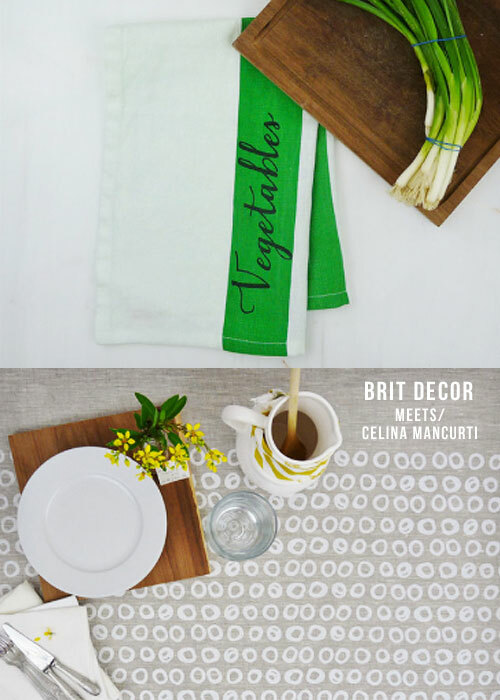 So imagine my delight when I had the chance to talk textiles with the very talented Celina Mancurti! The Argentinian textile designer is now based in the USA but still channels her proud heritage into her designs with a strong leaning towards organic fibres, handcrafted fabrics and sustainable designs. The result; an elegant collection of handprinted pure linen products. What do I like about this collection? In a nutshell, the sheer beauty of the natural fibres combined with energetic patterns - simple style with impact, which pretty much sums up the Brit Decor ethos too. What made you decide to start up your own business? Ten years ago, I decided to leave my home and career in Buenos Aires to follow my husband to the United States. I searched for jobs in the fashion industry but had no luck. I eventually landed a job as an instructor of textile courses at a major university. I enjoyed teaching and getting to know my students, but through it all, the dream stuck with me; I knew I had to pursue it. During one of my trips back to Argentina, I packed a couple of flat screens and some buttons from my grandmother's sewing box to come back with me to the States. When I returned, I bought a large wood board and following my passion for textiles, I began printing fabrics in my basement. During the 2008 holiday season, I printed my first tablecloth adorned with my grandmother's buttons and sent it to the lovely town of Jim Thorpe, Pennsylvania. The feedback was positive and overwhelming! In April 2009, I opened an Etsy™ shop with six tablecloths and walked into stores to seek opportunities to sell my linens. Was it a tough thing to do at the time? To be uprooted was life-changing; it was like starting my life from scratch. What advice would you give to other creatives who are thinking about setting up their own business? It took many experiments and a lot of hard work to transform those six tablecloths into the business I have today; a fully handcrafted eco-friendly Table & Kitchen Linens collection, a hand-printed fabric line, and my latest project, the Wedding Collection. To get to this point, I have learned to be patient as well as not to wait to have everything in place to move forward with a project or idea because there is always more to do, more to accomplish. My workspace is where my visions became a reality. Fittingly, the printing table is the centerpiece of the room. The walls are filled with flat screens, squeegees, inks and linen rolls while my desk is stocked with draft designs, color samples and supplies that keep my inspired. Linen is one of the oldest textiles in the world. It is made from the fibers of the flax plant and flax is considered eco-friendly by nature thanks to its ecological essence. It is very absorbent and has exceptional durability and drape. I do not have a specific way and/or place to find inspiration. I get inspired by unexpected things like vintage stores, travels, food, people in the street, a book, a blog, a draw from my kids, something that someone says, a movie….everything would be the starting point for a new idea! Can you name three of your favorite pieces of work and explain why you chose them? Love my dishtowels – why? They are simple and practical; they can be used as placemats, small tablecloths, you can wrap a gift and or just dry dishes! Tablecloths & Napkins - I want my designs to move people to create special moments that would stay with them forever. 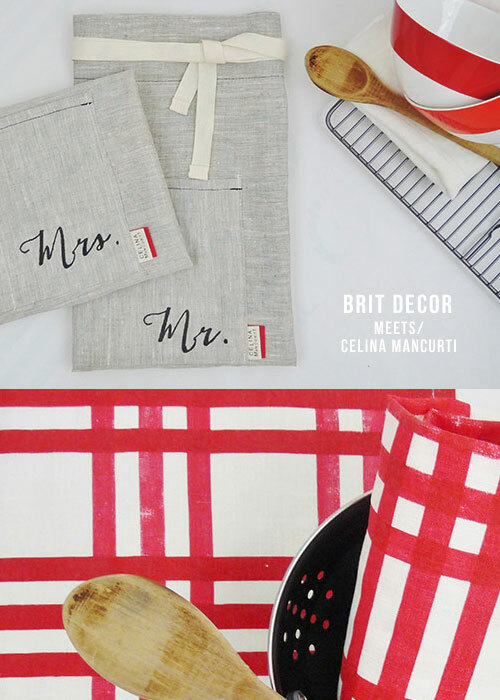 I want my creations to inspire them to wear an apron and cook for their loved ones and to set the table with a lovely linen and cloth napkins for your everyday meals. By continuing to add unique designs to our collection, we hope to increase our customer base to include interior designers and wedding/event planners. 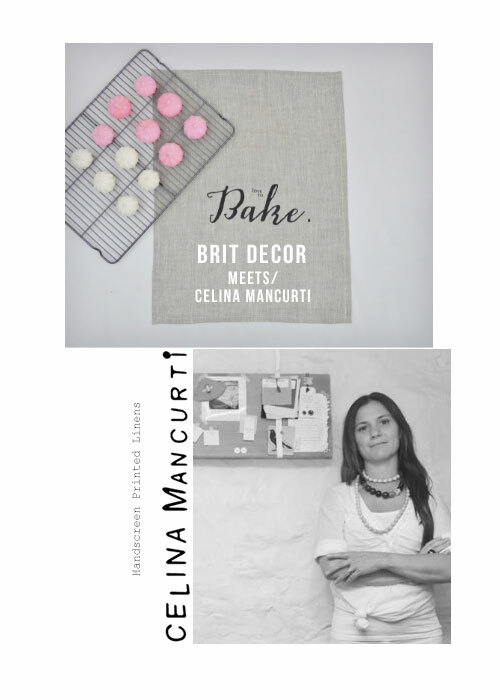 As a special limited offer for all of my Brit Decor friends, if you buy any products from Celina Mancurti quote BRITDECOR and you'll receive a whopping 20% discount. Offer closes 19th September 2014.